A visit to La Maison du Chocolat & Head Chef Nicolas Cloiseau. As I look towards Christmas I will start with that classy French act who bring us an annual masterclass in festive chocolate. 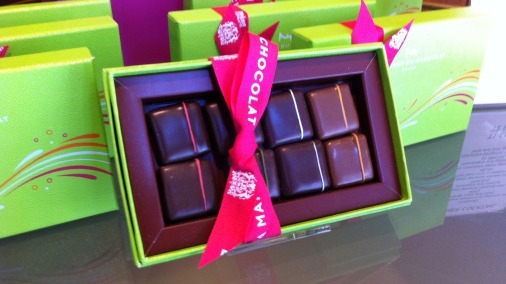 La Maison du Chocolat sets a global standard for excellent fine chocolates. Since 1977, when Robert Linxe opened the first Paris shop, there has been attention to detail and a real love of fine chocolate at the core. They now have a worldwide presence, with shops across France, Hong Kong, Japan, Kuwait, United Arab Emirates, the United Kingdom and the United States. I was not without nerves when I prepared for my day at their atelier outside Paris, where I was to spend time with the current master Chef, Nicolas Cloiseau. The rendezvous had taken some months in the planning, he is a man with an empire to run, and I was unsure what I would find at the heart of an operation of this size. Having said that I had met M Cloiseau before, at a rare appearance at one of the regular launches of his seasonal chocolate collections in London. I had found him extremely gracious, eager to explain the ideas and the detail behind the chocolates he was presenting. An unprecedented treat, a preview tasting of the new ganaches. In the event I was blown away by what I found, and by the generous consideration given to the day I spent there. Sandrine, their head of communications, herself with a fine pedigree in the fine food industry, arranged everything for me with such elegance and style, even to the point of driving me to the workshops in Nanterre to give me an easier journey, and understanding that I would want little for lunch other than a light salad. Thank you Sandrine! She was apologetic that the atelier was not glamorous, but functional. I think it goes without saying that the requirements of a production unit are to best serve production, not to woo the eye. 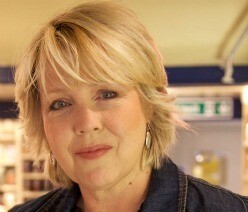 However the day I get bored of being in a chocolate factory I know I am in trouble! 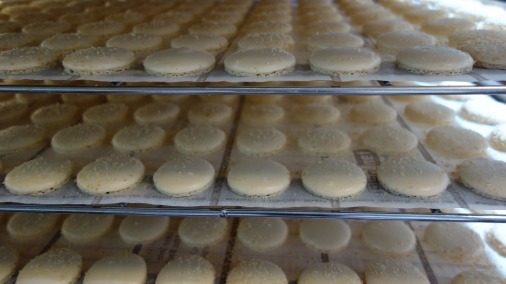 Not forgetting the pastry, macarons in the making. The workshops are actually delightful, a series of moderate sized rooms, each with their own function, and complete with a charming team of worker bees, intent on the task in hand. The whole feels happy, industrious, intent on perfection and taste. Each room has a subtly different smell, a little more toasted here, a little sweeter there, maybe a drop of coffee in this next one. The sense of wonder was increased by a little clutch of wide-eyed children, in mini versions of the regulation white coats and hairnets, gasping with each new thing they were shown. 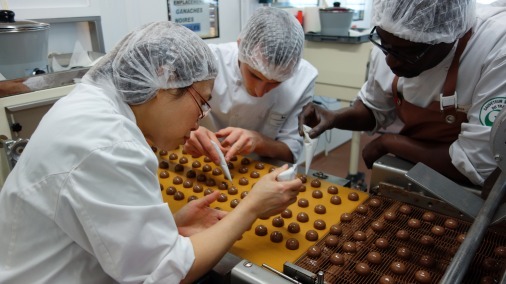 It turns out that La Maison du Chocolat have regular open Wednesdays during the summer, when employees can bring their families to see where they work. This crew clearly thought it was very cool that mummy works in a chocolate factory. Who wouldn’t! In one room at the heart of it, in between the pastry room and the one where the ganaches are prepared, is Nicolas Cloiseau’s HQ, a room where he and just two other chefs, cook up recipes, taste, design, create. There is nothing industrial about La Maison du Chocolat’s production at all, which is surprising and wonderful, given their scope. All the chocolates for all their stores worldwide are made in this very building in Nanterre. And while there are some tempering machines, the kind of enrobing conveyor belts I have seen in far smaller outfits, and a very well organised hygiene regime, the dominant impression is of a kitchen. 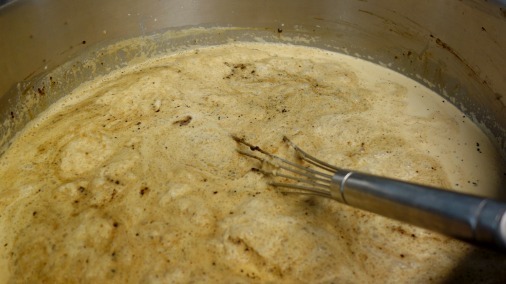 Large pans cook up cream for ganaches; the one with coffee added and a huge whisk is giving off a particularly nice smell. Lozenge shapes are cut in small batches by hand from ganache using a mandolin, prior to enrobing. Little groups of chefs with tiny piping bags dot and dash the appropriate decoration onto each finished chocolate, one by one. Precision hand decorating in action. M Cloiseau himself is a quiet presence, focused, and when he speaks it is softly, but rapidly and with assurance. There is tremendous depth of thought and intent, and while he is not quick to smile, when he does you can’t help but share in his amusement. We start the conversation over an unconventional breakfast of chocolate cake, a delicious La Maison du Chocolat classic called ‘Pleyel’, which is a little like a light brownie loaf cake, and hot chocolate, of course. M Cloiseau abstains from the breakfast, as he has been there an hour already doing one of his fortnightly patisserie tastings, at which he checks the quality and consistency of all the current patisserie making its way into the Paris stores. 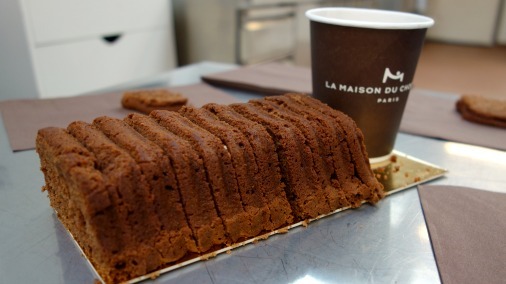 Due to the nature of cake, patisserie has to be made in La Maison du Chocolat kitchens local to the stores. Breakfast, La Maison du Chocolat style. During my visit they are just putting the finishing touches to the Christmas showpiece collection. I have a date to taste the Christmas chocolates in London the following week (early July at the time). M Cloiseau explains how he works a year in advance of each festival, allowing him time to create recipes, and go through a process of tasting each with a team of five trusted colleagues. At each tasting they tweak and discuss until he feels they have a balanced and exciting recipe. 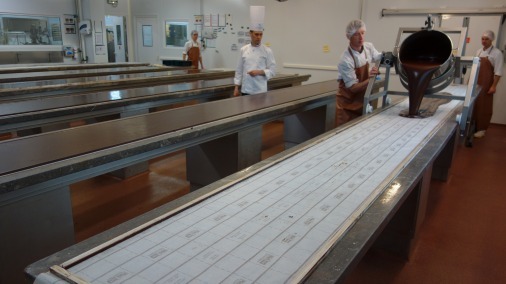 Then the chocolate is rested for 4 weeks, during which time it is tasted weekly, to ensure that it is stable, and of top quality during the whole of its shelf life. If it passes the test it may then form part of the seasonal collection and will be passed to marketing, so they can start to work on literature, packaging and the like. 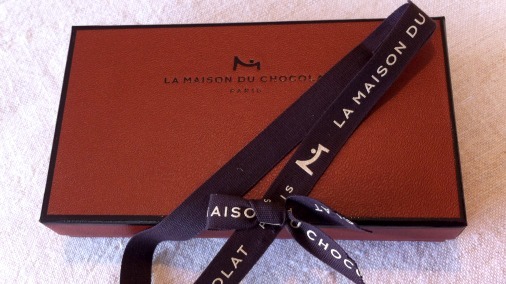 The packaging at La Maison du Chocolat is always pared back, classic and sumptuous, they have a new lovely cloth ribbon made for every collection. I have long admired the elegant and technical showpieces that appear in the shops for Christmas, but that which is now put in front of me by the creator himself surpasses any I have seen. My photos do not do it justice. M Cloiseau’s interest in creating these stunning designs is two-fold, he wants to remake the traditional symbols we associate with seasonal holidays, and bring lightness and architectural rigour to his pieces. The Christmas tree in front of me has done all of these things, with supreme style. It has no trunk, but is constructed from oval layers of dark chocolate pierced with a pattern circular marks. The overall structure evokes for me the elegance of 1930s buildings and interiors, highly decorative with very clean lines. The warmth and celebratory element comes, instead of hanging on the tree, hanging in the tree. The baubles, such as they are, comprise little chocolate pinecones, mini spheres and impressive large teardrop hanging decorations. These last literally hang within the structure and move gently as the tree is moved. As well as being technically exceptional it is quite beautiful. The teardrops are cut away at the front and filled with a lovely jigsaw of seasonal nuts, some of which are gilded. Chef Cloiseau adjusts the tree piece montée. There are also smaller versions of the teardrops to buy, and a beautiful range of buches de Noel, the log shaped cakes that are a seasonal must-have in France. It is a stunning collection. A detail of that spectacular tree. It therefore doesn’t surprise me when M Cloiseau tells me that his first senior position at La Maison du Chocolat was heading up a design studio in 2001 when the company moved into their new workshops in Nanterre and space made it possible. 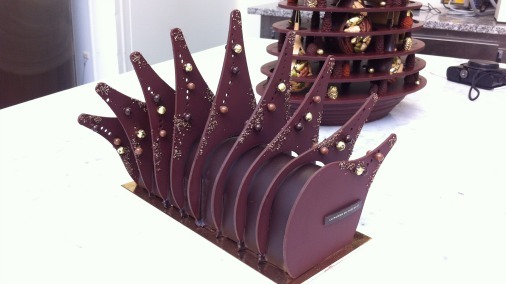 La Maison du Chocolat’s founder Robert Linxe, gave him the opportunity and later supported him through the rigorous three year preparation to compete for his Maitre Ouvrier de France award in 2007, which he won. It is a great honour to be a MOF, and all who have achieved it wear their elite stripes with pride. 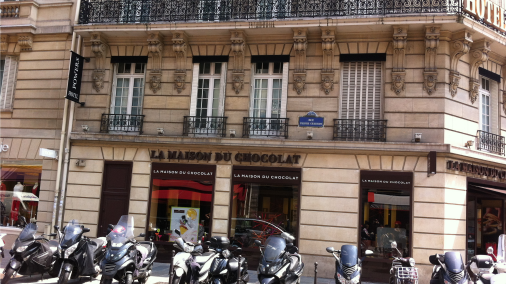 What is clear is that M Cloiseau has a close and harmonious relationship with Robert Linxe, and is at pains to honour and respect all that La Maison du Chocolat became under its illustrious founder. 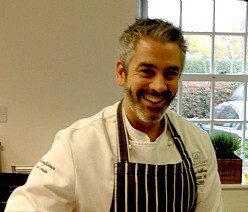 He started there 18 years ago, straight from patisserie training in his native Brittany. He had a great desire to spend a couple of years specialising in chocolate, but found nowhere local to him where he could do it. 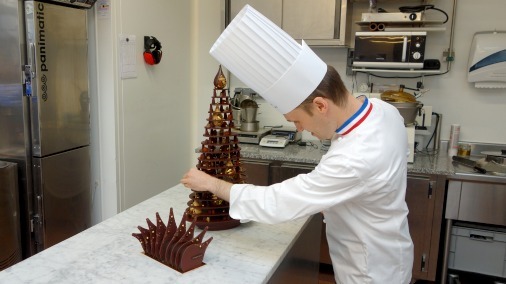 He began with a plan to spend 2 years at La Maison du Chocolat, but never left. During his first 4 years he worked every section in the kitchen, learning every detail of every element of the creation of the chocolates. This is a practice that continues to this day, so that every chef experiences and learns the entire process. From 2001 in the new building he was running the design atelier, and then after his MOF M Linxe began to take a back seat and gradually hand over the top job. When I ask whether there have been difficulties in taking over the helm of such an organisation it is clear that the whole has taken place without drama. Nicolas Cloiseau was mentored by Robert Linxe, and has the best interests of the company as his passion. 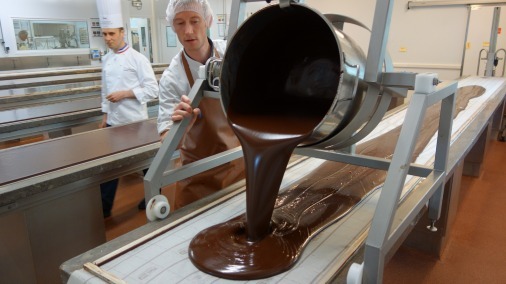 Salle à Marbres, ganache pouring 1. As a chocolatier he is of course a different man to M Linxe, and his creative challenge is to both respect the heritage of the house and still innovate. In this it is much like a young designer taking over at a grand couture fashion house. At La Maison du Chocolat it is achieved by a combination of things. The classic standards of the collection, chocolates that make up the backbone of what is on offer, that customers love and expect, must stay in place. But they are tweaked, updated, to keep them in line with current taste. For example there is less sugar used now, things are less sweet. I love M Cloiseau’s description of his use of sugar, that for him it is a seasoning, it should not be there for its own taste, but to reveal taste. 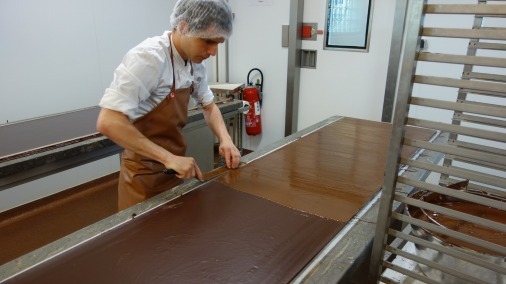 Salle à Marbres, ganache pouring 2. In addition to the classics of the house there are regular new collections, seasonal releases or collaborations, that allow a completely new set of flavours, created in such a way as to chime in well with the house style. What is key in a chocolate from La Maison du Chocolat is that the chocolate comes first, that the flavour doesn’t overwhelm. In eating the chocolate you will taste the chocolate first, then any added flavour, then you will be left with chocolate. It is a subtle, elegant style, a clean pleasure, whose lightness of touch belies all the care that has been taken in its creation and construction. 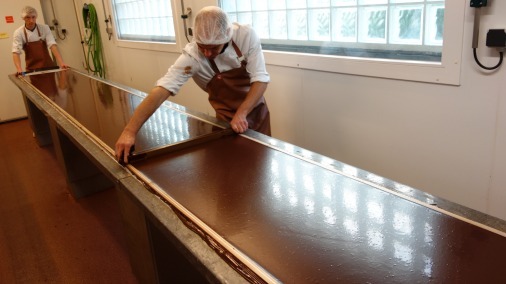 Salle à Marbres, ganache pouring 3. In the first room, where ganaches are created, sacks of chocolate represent the beginning of a journey. 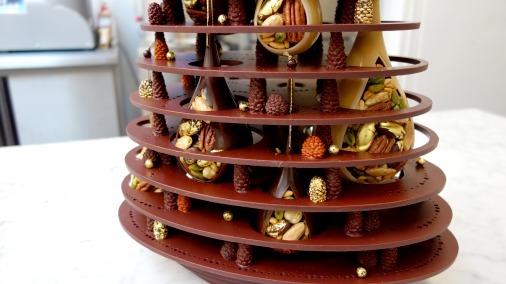 M Cloiseau works with Valrhona chocolate in all the recipes, using some of their established couvertures, and some that are made bespoke for him. He is keen to point out that his training with M Linxe impressed on him the importance of balance in taste, so while it may be relevant, and is certainly fashionable, to use a single origin chocolate, he will only do so if the result is better than a it would be with a tailored blend. The next production step happens in the glorious ‘salle a marbres’ (room of marble), which I rather more crudely called the ‘chambres à ganaches’ (the ganaches bedroom). 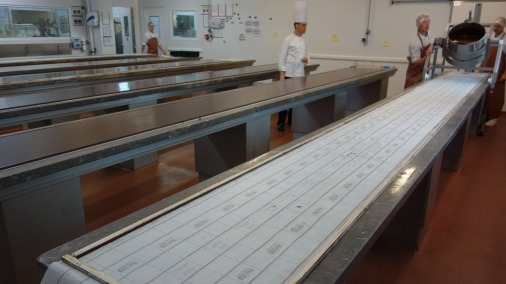 Here the ganaches are poured between rulers of the correctly selected height onto marble tables. 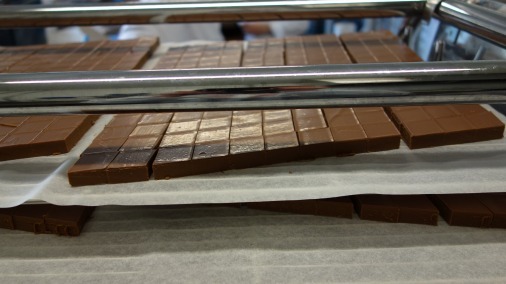 The depth of a chocolate can vary between 5mm and 15mm depending what suits the recipe, a more intensely flavoured ganache is likely to be thinner. 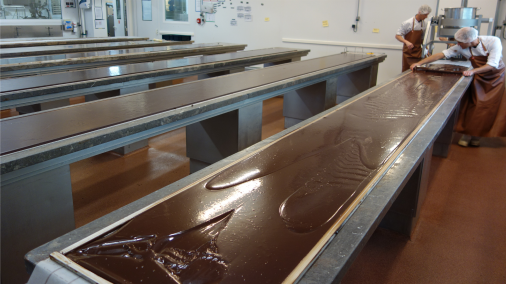 Each recipe gets its own labelled ‘bed’ and is then left to firm and settle, after which time a fine coating of tempered chocolate is layered on, to assist in precise cutting and enrobing. 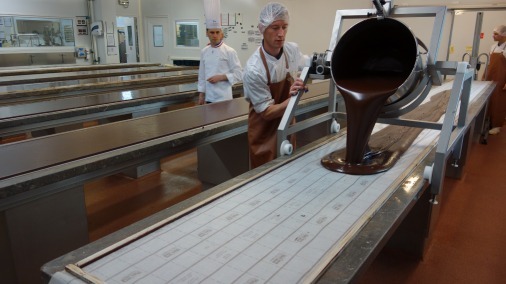 The following day the chocolates are then cut into squares, lozenges or rectangles, and then taken to the cool room. 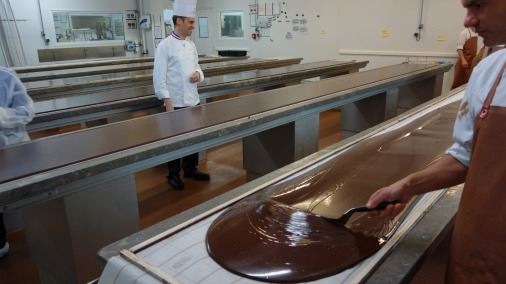 Salle à Marbres, ganache pouring 4. The cool room was my favourite part of the visit, here the chocolates wait before the final part of their three day journey; enrobing and decoration. Here it is possible to try the unadorned ganache and Nicolas does so regularly with his team of five, especially when a recipe hasn’t gone into full production yet. There were two here that are proposed for next year’s Valentines collection, which will be a suite of 4 caramels. Calling someone ‘mon petit caramel’ in France is much like called them your sweet or your honey in the UK. A pineapple and ginger is rich with the buttery sweetness of well caramelised fruit, and warm with spice that develops towards the end of the melt. I particularly like the next, a ganache with milk caramel flavoured with Rooibos tea, it has a very rounded woody taste, like delicate spice. Rooibos tea isn’t floral or aromatic, but earthy, which works perfectly here with the caramel notes. The final chocolate we taste here is a creation of M Cloiseau that has been so successful it has now moved over into the main collection of the house and become one of their standards. The Cassis is a fine square of ganache, flavoured both with the pulp of blackcurrant fruit and an infusion of the earliest spring leaf buds. The result is something bright and full of intense fruit, in perfect harmony with a fruity dark chocolate, that also delivers gentle waves of something greener and more floral. Very good indeed! We will skim quickly over the next room, where the chocolates are enrobed and decorated after being brought back up to the correct temperature. They let me have a go, and it was rather wonderful making fine bright lines of red whizz across the glossy dark rectangles. But then somewhat mortifying to see M Cloiseau discreetly pop those I had made aside into a reject box in the packing room. His eagle eye spotted my sub-standard creations instantly. Back in the central development kitchen we tried a couple of the chocolates from the summer 2014 release; a collaboration with Hotel Le Bristol and their Chef Barman Maxime Hoerth. They have reinvented some of the classic cocktails of the Bar du Bristol in chocolate form. The crowd pleasing and most popular creation, the Faubourg, delivers a fruity hit from a combination of mango and passion fruit, given depth and balance by vanilla and a touch of honey. My favourite of the two I tasted that day was So Bristol, a seamless marriage of bergamot tea, lime, grapefruit and elderflower. The collaboration with Le Bar Bristol. Thanks to the nature of the process, and because I am in the workshop where it all happens, I am extremely privileged to try a few chocolates in production, some that are not even finished recipes yet. These were for the 2015 Japanese Valentines release, and were only on their second tasting. Valentines is a huge festival in Japan, and La Maison du Chocolat have a thriving business there. It is almost as big a time for gifts as Christmas, and is marked by women giving gifts and chocolates to all the men in their lives, father, brothers, not just lovers and husbands. Apparently this is evened out by White Day, a month earlier, when the men start the giving. The chocolates we tasted were the White Day range. M Cloiseau was developing very feminine recipes with rose at the heart, a flavour that is notoriously difficult to balance. A chocolate with rose and peach is a delightful idea and set of tastes, but deemed not quite balanced yet, however another with rose, mint and a mild red pepper is quite delicious, fresh and yet with warmth, the floral notes rendering it wonderfully aromatic. Almost finished, smooth as glass! We could, and did, talk for hours, about visiting plantations and then the importance of every ongoing process to ensure the quality and taste profile of a chocolate is kept, about the wonderful seafood of M Cloiseau’s native Brittany, about caring, above all, that the chocolates and patisserie are wonderful to eat. But there sadly came a time when he needed to return to the job, and Sandrine and I needed to depart for a chocolate mousse workshop that they were holding in advance of a launch of new recipes in the autumn. A hungry and excitable group of children awaited, thrilled to be given the chance to have a go at making and pouring ganache, and then custom decorating their mousses. The first fine layer of enrobing is applied. All in all it was a magnificent day, and quite unexpected. I knew that the chocolate would be top quality, what I did not expect was that I would be so excited and delighted by the new recipes and designs they are working on. There is much much more than the standards, and the standards themselves have a new eye, a new palate, ensuring they taste better than ever. I also did not realise how human, how artisanal, how passionate, was the beating heart of the company behind its sleek, classic, elegantly beribboned exterior. 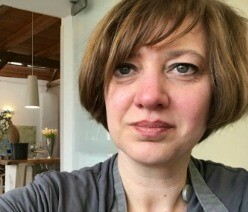 Thank you Sandrine and M Cloiseau for that insight, for divine tastes, and for a wonderful day. La Maison du Chocolat has boutiques worldwide, online sales, and their exceptional Christmas chocolates and chocolate showpieces are now on sale.